Ledra Street has been recently opened in Nicosia in April 2008 and offers pedestrian access to the North side of Nicosia and is open 24 hours a day. To see the opening of the crossing here is a video from the Al- Jeezera News Station that captures the scene of people waiting in anticipation, the words spoken by the representatives from both sides and the emotions of the time. It does start with an incident when the Ledra street crossing closed for a while later on during the day of opening but it is mostly the report about the border opening. The crossing area as it used to look but now of course this area is the most central crossing point right in the middle of Nicosia. 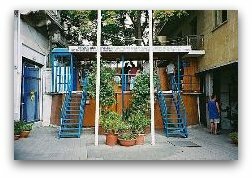 You used to be able to climb the stairs and have a look over into no mans land that was patrolled by the United Nations. Now can walk across freely and stay and even leave the island via Ercan airport and fly to Istanbul if you wish. If you are an EU national, there are no formalities as Cyprus is a full member of the European Union. You can just go through Greek Cypriot checkpoint quite easily. If you are a non European national make sure you get yourself stamped out of the Republic by the Greek Cypriots because on the way back in to the South side you have to prove that you did not enter the island illegally from the North side. This is really important, so make sure you follow the instruction. When you reach the Turkish Cypriot checkpoint you will have to present your passport, wherever you come from, EU or Non EU national and you will obtain a visa on a seperate piece of paper. You do not want a stamp in your passport because this will cause problems on the way back into the South. Update Summer 2012: I recently crossed the checkpoint here, inadvertently my British passport was stamped, I had a stamp on the way back into the Republic and the Greek checkpoint were not in the least bit interested in looking, at me or anyone's passport, they were only interested in the family in front who had purchased goods to bring back, so perhaps it is not such an issue after all! When you return you have to give back your visa, so make sure you guard it with your life and return it to the people at the Turkish checkpoint. You then proceed to the Greek Cypriot check point and your passport may be scrutinised, as I mentioned in the summer update 2012, it may not! EU Nationals automatically gain entry but this is where, if you are non EU national it is important you were stamped out. You CANNOT bring a hire/rental car from North to South. Are There Any Other Crossings? Yes there are, 5 others in fact and you will have to go through the same crossing procedure as if you were using Ledra Street except you will probably have a car, so take note of the information regarding transport and insurance issues. This crossing is in Nicosia but it is West of Ledra Street and was the original crossing over the green line that we used to use when we went to visit the north side. You can only cross on foot and it is open 24 hours. This is to the East of Ledra street and open 24 hours. You can take your car across at this point, and then head off to whatever part of the island you want to go to. Kyrenia is about half an hour from here. Sometimes free maps are available at the checkpoint. Note you will have to buy extra insurance for 25 euros and it lasts for 1 month but be aware it is only 3rd Party Insurance. If you live in the South you can purchase annual insurance for your care and it is approx 60 Euros for the year. If you have a hire car, more than likely it will advise in your contract that you cannot take your vehicle into the north side. You may find if you use a large well known, world wide brand of car rental you may be allowed to take your car over the border, but PLEASE CHECK FIRST with the company before committing yourself to a booking. To be honest, the information regarding car hire and insurance seems to change depending on who you speak with, so make sure you do your homework. You could also get someone to meet you at any of the checkpoints and they can take you to their car hire office to complete the paperwork. You could also make similar arrangements in advance with a local taxi firm if you prefer not to drive. This is west of Nicosia around Morphou and it was the last crossing to be opened. Useful if you are at the Polis and Latchi end of the island. You can cross on foot or with a vehicle. Always been there as long as we can remember. It was the route you took when in the military if you were going to spend some R & R in the north side, crossing by vehicle and staying for 3 nights. Not sure if civilians can use this crossing or if just for the military people of the island. This one is found in Sovereign Base Area. Update: crossed back into the Republic here in July 2012, on the way back from Famagusta, so no issue at all. FOR the residents of Pyrgos the opening of Pyrgos-Limnitis crossing point is nothing short of a desperately sought lifeline. The isolated village consists of the larger Kato Pyrgos and the smaller Pano Pyrgos, both of which nestle in the western foothills of the Troodos mountains and are accessed only by a steep narrow twisting road up from Polis, or an even more tortuous route across the mountains. 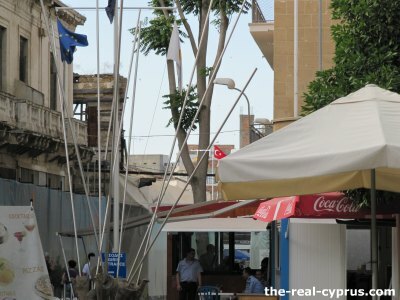 It currently takes residents of Pyrgos over three hours to get to Nicosia. Opening the Limnitis crossing will cut this down to under an hour. A large part of its inaccessibility is a result of the Turkish-controlled enclave of Kokkina on the coast to the south of Pyrgos, forcing visitors to go on a picturesque but long detour inland. Anything Else I Need To Know About Ledra Street Crossing? Yes, you might well want to know that you cannot buy much and bring it back. The current limit is 135 euros of stuff. Cars are searched on the way back into the republic. Cigarettes and alcohol are particularly frowned upon if you try to bring them in OVER your limits and you are caught. But 135 euros could buy you quite a lot! You can use euros for shopping or Turkish lira. You can exchange funds when you cross.